Vitré is a historic town in central Brittany, about 25 kilometres east of Rennes in the Ille-et-Vilaine department and an hour and a half from the Brittany coast to the north. Because of its location Vitré is less visited than it would be if nearer the coast - but if you have the time we suggest you make the effort to get here! Vitré has a very attractive and extensive well maintained old-town centre with lots of narrow streets lined with medieval cottages and also a magnificent castle and is perhaps the most impressive medieval town in Brittany. 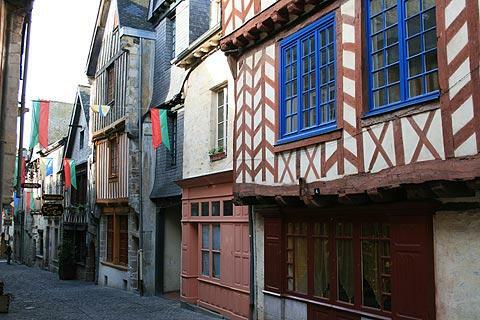 The town is a listed Art and Heritage town and has many 15th and 16th century buildings remaining much as they were in the days when it was one of the most powerful towns in Brittany. A significant part of the original ramparts of the town is also still intact. You will also see the attractive 15th century Church of Notre-Dame, quickly recognisable because of its decorated spire. Don't overlook this church because the castle is the principal monument in Vitré: the church is an interesting example of the Flamboyant Gothic style and also contains interesting items including an impressive stained glass window. Note: the gothic style south side is the most interesting part of the cathedral so don't rush straight in the front entrance without looking around the outside! 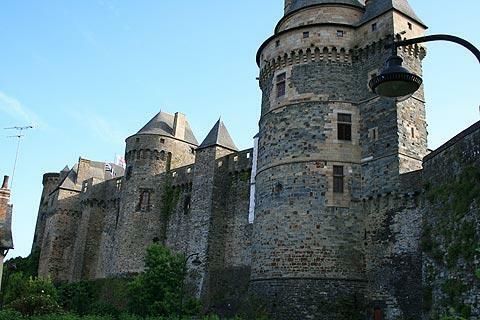 Vitre is also endowed with a castle, built in the 13th century and with many additions to the fortifications in the following centuries. The castle, an imposing building with many towers inset in the high walls and reached across a drawbridge, surely competes with Chateau de Jumilhac in the Dordogne for being the castle with the most pointed turrets! 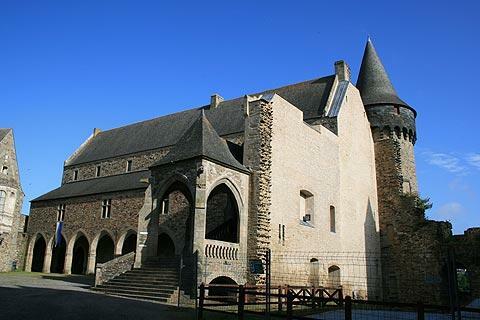 The Chateau is unusual in that, with its attached buildings, it has been built in a triangular pattern. This is because of the shape of the raised rocky area it was built on. 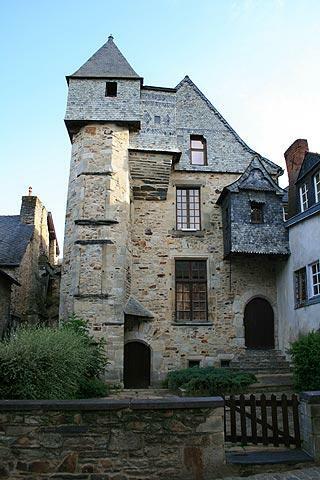 Vitre castle contains a museum with an extensive range of sculptures and artworks from the region, mostly paintings, sculpture and tapestries from the 16th and 17th centuries. The Mairie of Vitré is housed in one of the buildings in the Chateau complex - wander into the triangular courtyard to see the lovely building. From the same period you can also see parts of the original ramparts that once protected Vitré. 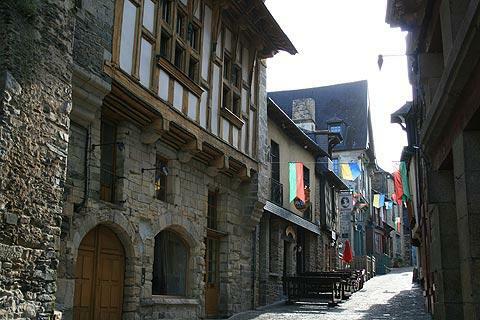 Vitré really is a pleasure to explore with its medieval centre, particularly the streets of Rue de la Beaudrairie (street of people who worked with leather), the Rue de la Poterie and the Rue du Chateau. 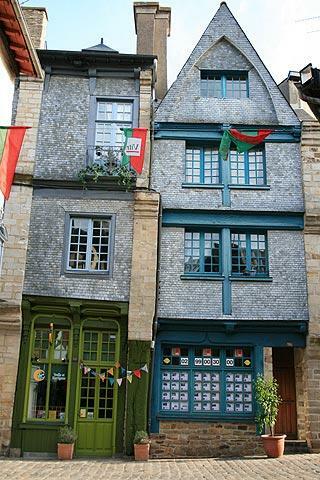 In the rue de la Poterie you can see several rare examples of houses with medieval porches at street level. Market day is Monday for Vitré and is held on the square in front of the church of Notre Dame. At nightfall Vitré is illuminated and in 2000 won an award for its nighttime illuminations. A short distance outside Vitre, the Château des Rochers-Sévigné and its associated garden are also well worth visiting as is the collegial church at Champeaux. 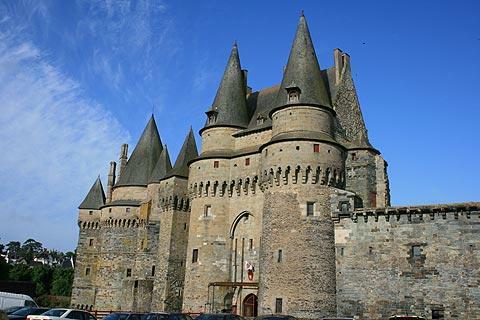 Further afield, a tour of this region of Brittany should also include the historic centres of Fougères to the north and Rennes to the west of Vitré.